Our latest research into mobile brand experiences has unearthed data that reinforces what you may already suspect: Speed and relevance are crucial to customer satisfaction. But it may surprise you to learn that in the mobile marketing arena, a “neutral” experience can be a negative one. More than ever before, people have higher expectations for the experiences they have with brands on their phones. That's likely because it’s where they're spending much of their time. In fact, people today have 2X more interactions with brands on mobile than anywhere else—that includes TV, in-store, you name it [see data].1 These mobile moments matter. Every time a consumer has an awesome experience with a brand, it raises the bar for what she expects from everyone else. But when that bar isn't met, it can have serious effects on your brand. To better understand how brand experiences can build or damage brand equity, Google collaborated with research firm Purchased on a study of more than 2,000 smartphone owners who kept a daily diary for a week. From over 17,000 brand experiences, we specifically analyzed how people value mobile experiences with brands and, ultimately, how that translates into building brand equity. Based on our findings, here are three things to look out for. 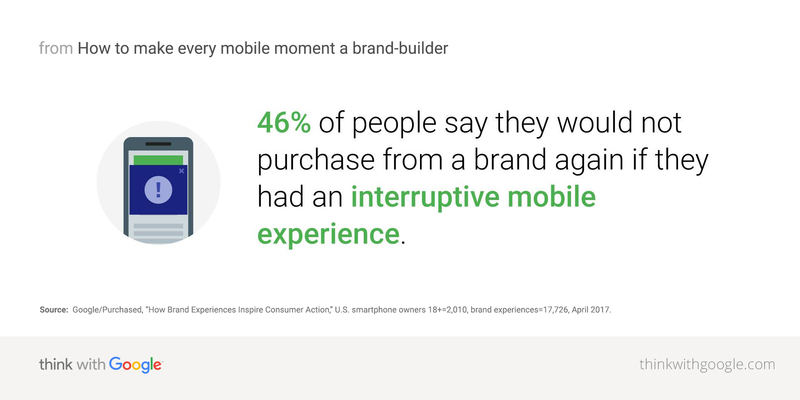 When people have a negative brand experience on mobile, they are over 60% less likely to purchase from that brand in the future[see data].2 And when it comes to negative mobile interactions, one of the top complaints we heard is "slow experience." One of the biggest challenges people told us they have with brand experiences on mobile is “not being able to find the information they need.” On mobile, discovery is key. Simple navigation and site search save people time, allowing them to filter by what they’re looking for. Simple navigation and site search save people time because it allows them to filter for what they’re looking for. With shopping, for example, remember to also remove friction from the checkout experience by pre-filling user preferences, or using a third-party checkout service that already has billing information saved. Mobile visitors may also be researching to convert later. Offer a save-to-cart functionality or a simple way for them to resume their journey on another device. 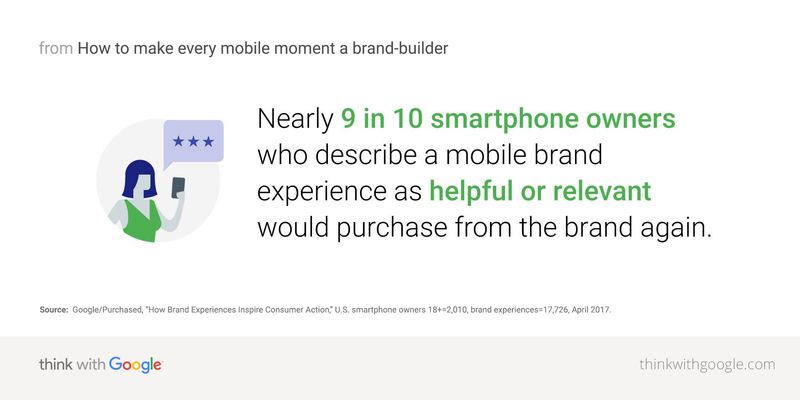 Source: Google/Purchased, “How Brand Experiences Inspire Consumer Action,” U.S. smartphone owners 18+=2,010, brand experiences=17,726, April 2017. Consumers also expect mobile experiences to be relevant to them. Brands must anticipate the needs of their customers and offer products or solutions that are useful to them in the moment. Tapping into how people search can unlock powerful signals of intent. If you can understand where customers are in their shopping journey, you can deliver relevant messaging. For example, a person searching for “affordable hiking boots” is likely early in the shopping journey and looking for a deal. Someone searching for “best backpacking boots” could be looking to comparison shop for quality and may be in the market to buy other essential travel items for a backpacking trip. Someone searching for “hiking equipment store near me” may be lower in the purchase funnel and ready to buy now. Using these search signals can enable you to be more relevant to users in their individual moments of need. In our research, we found that an experience considered “neutral” is actually a negative driver of purchase and recommendation. When a company doesn’t provide a delightful or relevant mobile experience, it can hurt the perception of its brand. For instance, seeing an ad for flights to Mexico when you’re searching for flight deals to Florida. People expect a travel company to understand their needs, especially if they’ve been leaving clues such as their browsing behaviors. But even worse than being neutral or irrelevant is being interruptive. Forty-six percent of people say they would not purchase from a brand again if they had an interruptive mobile experience[see data].6 People specifically mentioned annoying pop-ups that block content or full-screen ads that force a user to scroll through to view content are examples of bad ad experiences that drive negative brand perceptions. Marketers can check out the Coalition for Better Ads’ standards to see what else people want and don’t want when it comes to mobile ads. Consumers want to be in control of the content they consume. A brand that doesn’t allow consumers to feel empowered could be hurting its relationship with them. This isn’t just a matter of slow loading sites or avoiding annoying experiences, though brands should figure out the things people don’t want—annoying pop-up ads, for example—and steer clear of them. When it comes to mobile, marketers also need to proactively help people. Whether it be through speed, assistance, or relevance, consumers should feel like they’re in control every step of the way. That’s the recipe for a positive brand experience. 1,2,4-6 Google/Purchased, “How Brand Experiences Inspire Consumer Action,” U.S. smartphone owners 18+=2,010, brand experiences=17,726, April 2017. 3 Google Data, Aggregated, anonymized Google Analytics data from a sample of mWeb sites opted into sharing benchmark data, n=3.7K, Global, March 2016.